The original of this list is not in the best condition and some names are scarcely legible. It was of course written in ink with a quill pen so ink density varies greatly and there are many smudges, including some where the pages were turned without blotting. A scan of the first page is available to show the condition. The originals may, of course be a litle better! The original is in a notebook with pages some 6" x 8" with two columns of names to a page. This was photocopied and the photocopy used to prepare these notes. Sometimes the photocopy misses the edge of the original and a name is bisected. Any transcription such as this has to be an interpretation. So I have added notes to explain what we are interpreting and to try and show when there may be doubt. These notes appear after the family to which they refer. Some of the families have been crossed out with a large X through the family, presumably they had moved, or they could be errors, corrected. Sometimes the crossing out is script 'Removed to ...' - sometimes a line. These families are commented. Some of the individual names have also been crossed out: these are so marked in the HTML. Sometimes there is a note 'Dead' sometimes none. Had these people died, left home or were some errors that are being corrected? The original list had all the families numbered and all individuals were also numbered. This numbering seems to have been added after the main list was written but the layout leaves room for it so one could expect that it was part of the original scheme. It has been reproduced below. Sometimes additional families have been inserted in gaps and new members have been added: these additions are of course un-numbered. There is however no evidence to show when these additions were made. However it is very clear that the list was worked on several times. The person numbers must have been added after the main list was compiled: the lines separating the families are in fact pecked - four separate lines and in the centre gap has been inserted the family number. But as some persons are not numbered: these must presumably have been entered after the numbering, indicating at least three sessions on the original, presumably more. There are a number of inconsistencies in a style which is consistent enough to show them up. They may therefore have significance (or maybe not) so comments have been added. Although it has been necessary to transcribe copies, there are clues that cannot be photocopied. Was the paper creased. Is that an ink blot or dirt. Is that name written over the line, or is the line over the name. These can only be seen by careful inspection of the original and they all affect the interpretation. So there are certainly errors in this list which might be corrected by comparing it with the original. Anyone reading this list who fancies doing more work on it will therefore need to print it out and sit with it comparing it with the actual manuscript to see if the additional visual clues such as texture and flatness clarify any ambiguities. There is a page (permanently in preparation) giving place names: the names that are 'hot-links' are linked to this page. This is centralisation to eventually locate all the places memtioned in all the documents on site. In red, after the original townland spelling, I am giving the modern equivalent as it is shown of the 1:50,000 Ordnance Survey maps, together with the map reference. See Itineraries for more explanation. Of course some of the townlands are not nowadays locatable for various reasons. It will take a while to fill in this information, so if you can help let me know. This would make it seem likely that the original was updated some 16 years after the first listing was made, but any difference is script styles is not easily evident so one cannot be certain when any alterations were made. The last name is displaced to the right and the forename is scarcely readable. It could be longer or double barrelled, though such names are rare on this list. The above family is in the crumpled corner of the first sheet and is scarcely readable. However we do know that there was a Hugh Torrance living in Mayoughill at that time. This appears to be he. The number 2 is written to the right of Jean Harper..Also her name is underlined as is Letitia McFetrick, as it to separate these last two people off. Susanna Dunlop also has 2 after her name. This surname is obscured by what appears to be an ink blot but has to be McMichael. Not a name included elsewhere on this list. (The above family is crossed out with a large X and the words 'To Coleramer' appear to the right. Page 2 in the photocopy I have does not have the numbers in the left hand side, there also appears to be a name truncated above Robert Clark. RJT. A Note to the right of this family says 'To Moneymore'. Although apparently listed as two families, both of these families are crossed out, with two Xs through the first and one through the second and the words 'Removed to Ballyagan' written through the first. The inference is that both have moved. The word 'widow' appears to be in a different hand. A Mary Kellaghan is listed in the 1821 census in Bovagh. A note to the right reads 'Moved to Myoghill'. Ester Walker's name is underlined (two separate lines). David Walker has one line and could be an underscore or possibly a crossing out. The last two are added to the right of the family listing. Above family is crossed out. The name Dugal is uncommon, but seems clear here. William Cambel. There is a blot after this and the crossing out goes through the W, but it could be Hill rather than William. Hill is not common as a forename but it is not unknown for a surname to be used as forename. Jas Conaway, inserted at bottom of this family, is spelt with one n, the others with two. This could indicate that the corrections may have been by a different person to the originals. However James Brown signed not only this list but also the 1825 one. 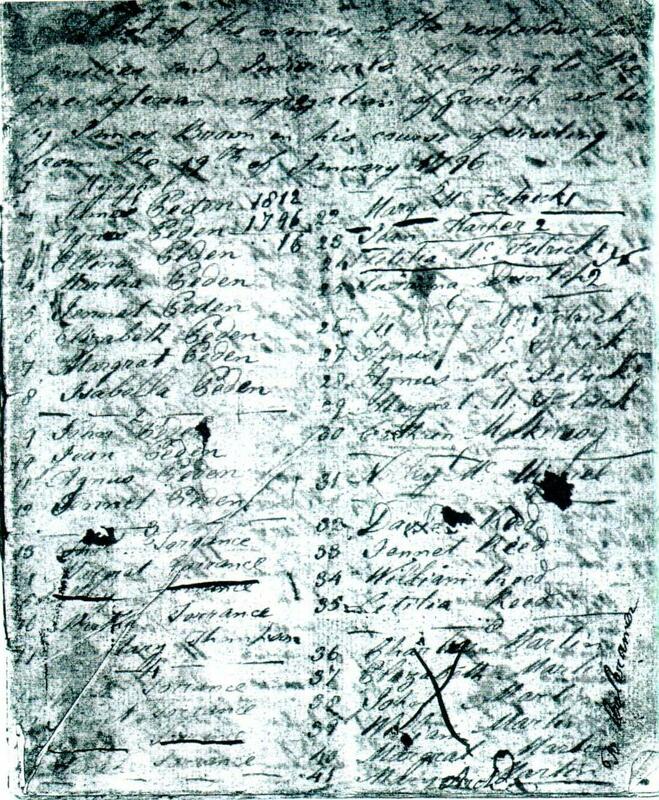 1818 list is unsigned but seems to be the same hand. These three are together, though James is poorly legible. Below them is a gap, a line in the shape of an arc, then follows the next name, seemingly in isolation. The name Margrat Gilmore is heavily crossed out as if to indicate an error. These names appear at the top of a column. The first five are faded and Arch'd Gilmore has clearly been written later as it partially overlaps the name above and is darker. Garland and James gave sworn oaths concerning an Affray with the Culnamen Torrenses. The three last are written to the side, vertically up the page but boxed into the Kennedy family. Megamery is an old form of the modern Montgomery, as is Mcgummery. Here it has been crossed out. There are other Herralds in the list - this scribe doesn't seem to like double letters! Above family is crossed out, though the X is somewhat indistinct. Movenis or Catherwoodstown C 86 16 is 1/2 mile west of Moneydig, on the way back to Garvagh. Above family is crossed out. The addition is probahly James but as it coincides with the crossing out, it is difficult to read. The name Ann is indistinct, but Mighel is readable. Mighel is the old form of the modern Michael. The word 'Betty' is a scrawl, barely readable. Last name is written vertically beside the family. First name Cornelous, is indistinct, it starts with a C and seems to end 'ous'. Last two are appended vertically beside the family. The modern form of this name is Tomlinson. The above unnumbered families are inserted in a gap at the end of the Movenis Upper list. There is a line separating Ann Mc Kee from James Quin but the Quin family has been circled, the circle seeming also to encompass the McKee family. The name Deborah seems unlikely, yet D--ora seems indisputable. Mising two letters could be e or i and h or d.
The name following that is indecipherable. It does appear to start J, but this is feint. The 2 seems to have been written over the name, and the descender of the final d could be an ink blot. If forced to make a guess, then Thomas. There is little doubt that the family is Dinnen - though that name does not appear eleswhere on this list. These names also are faint but clear. In particular it is difficult to see how else to read the uncommon name 'Brise'. Edward Brice was the first Presbyterian minister in Ireland, maybe this is named for him. The second Margrat Woodrah has been added at the bottom of the family and Robert Woodrah is added vertically to the right. Mary Lynd is heavily crossed out as if to show an error. Serah Anderson is added below and Wm Anderson to the right, vertically. Jean has been added to the bottom of the list, then Chas McMaster inserted between Elizabeth and Arch.d somewhat obscuring them. This family may be crossed out, but the crossing out is indistinct and could be general dirt. This family is crossed out. Mary is below the list, Jennet to the right. Serah Henderson and Wm Shails are added to the right of the main list. It seems as if Mrs Serah Henderson and Arch'd Shails two families combined, then they married. Modern form of the name is Sheils. Wm Jackson and Agnus Jackson and Wm Do are written to the right of the two following families, but there is a box which seems to connect them to this family. Why they should be written thus is not clear as there is space in the Jackson family which would have been an obvious place for their names if they are indeed connected. Two names are inserted below this family. The first appears to be Sam and the second could be Alex.r but it is across a line so is indistinct. The name Palluc is nowhere else listed, but it seems to be the name here. The modern form of the name is Pollock. The above surname is difficult to read, could also be McAskey. It does not match any other name on this list. Bellury is not numbered and appears to have been inserted later with the following family in a space ahead of the main Bellury entry. It is difficult to find any other way to read 'Bathsheba', rare though the name is. It is probably unimportant whether this family is Paton or Patan. It could be either. Mary Smyth and Agnus Smyth are crossed out as a block and beside the family are written Agnus Smyth and Wm Smyth. How else can you interpret that other than an error and Alexander Smyth's wife is Agnus, not Mary. The name Jacob is indistinct, but does appear to be such. Name could be Dallace or Dollace. Mihael - or is it Mihall? The 'h' could possibly be an 'k'. This family is beside the Dorrances, but ruled off from then. Names are difficult to distinguish, especially Eliza. Elizabeth is partly off the page edge, which also cuts off another name, possibly Ann. A line drawn under Margrat Paton appears to separate this entry into two. Below this the page is a little confused: the next family is numbered 110 but the names of the family members have not been numbered and the number 110 has been re-used under Tranaltinaugh. This seems to imply that these crossed out families are a mistake and also that the person numbers were not allocated when the original list was compiled but at a later date. A line has been drawn between 568 John Hilton and 569 James Hilton. Against this line is 'P10'. However, neither name is repeated elsewhere in this list. Elizabeth Patterson in the original is spelt Paterson. It is noticeable that a quill is being used: the ink is feint in 'George McCag' and has been replenished to fill in the 'hay'. Thereafter it is somewhat smudged! Family crossed out with a note across 'Removed to Traneltinagh'. Beneath this family is a line, below which is the next name 'Mary' - the surname has faded out, but the note seems to cover her as well. Moyletra Kill C 86 13. Also mentioned was Myletragh Toy. James McCaghay is heavily striked out with smudged ink, but it appears to be James. There is an insertion mark between John and Martin, with Martha Martin written to the right in the margin. The numbers follow the above so were clearly added after the list was first written. The name Thomas is nearly illegible: the T is mostly faded so does not look much like a T and the h looks more like a k. The ink was evidently running low. The surname 'Ray' is rare, but it is difficult to read this otherwise. The family above is in smaller script that the rest, clearly reduced to fit a gap, therefore entered after the main list, yet the names are readable. Cornelous is badly smudged at the beginning but a C is visible as is the ending -elous. Very smudged and cramped. To the right of the main column can just be made out John 724 and below that, King. The townland is faint and difficult to read, but must be between Lisachrin and Laragh. Knowing that, it reads as Crosslint C 86 10. The crossing out on the last name obscures the forename, but it is short. The name, probably Jean is scarcely readable as it is heavily crossed out. The names Jane Ann appear together and are difficult to read. Could be Jane Ann or Something Ann. Above name may be crossed out, but the intention is far from clear. Ballymenagh C 85 13 spelling unchanged! But there's another at C 80 22 - too far off the itinery. The 'h' of Serah is not present, but the ink is very low here. McGomery is one old form of Montgomery. Probably modern Carhill C 84 11 but there is a Cah at C 83 18 which is not near Ballydullaghan. William Waid Junr has a line through William only, then an underline below William Waid. Jennet is inserted between the names. The last name appears to be Biddey, but since it is part overwritten by Jennet, is debatable. Last two names are added, both on one line. here is no person numbered 840. Susanna Sutter Junr is either written over an underline or (seems more likely) has been crossed out. 'or Bridget' is inserted in small script between the other two. 874 has been heavily deleted as if an error and Elizabeth Holms added above. Last two names are added, vertically, in the margin. 'Removed to Garvagh' is written across the family. 'Removed to Ballyagan' is written across the family. Barnet is a rare name, not present elsewhere in this list, but can only be read as Barnet or Burnet. McIlhair is not otherwise listed, but is difficult to read any other way. Serah and Margrat are added to the side. George Nickel Senr: sic. The others are all Nickle. Spelling was mobile in those times. However: Senr. There is no other George in the family. Nor is Senr used elsewhere in the list. This may (or may not) have some implication. Is this Baveridge or Bereridge? The family is entered in a space at the end of Karrireagh and boxed as if to segregate then from the above. I take this to imply that they are in the next townland. Martha Morrison is lined out with three lines. Seems to indicate an error being corrected. Number 1001 has been omitted. Mary is heavily deleted. Gillmore sic. Elsewhere spelt Gilmore. Although this family is un numbered their position at the head of a column makes it clear that they were in the original list, so it is a mystery why they were omitted from the subsequent numbering. The number 213 here is not in a line as are other family numbers. The appearance is that the numbers were added after the list was compiled. However - without family or person numbers the list is very much continuous with nothing to separate it into families other than maybe a slight extra spacing between different families. Jidion: I fancy this is Gideon with a pen low on ink. But it's not quite right for that to be certain. Across this family is scribed 'Removed to Gorticloghan'. Just possibly 1053 Willm is crossed out. The ink runs low: 'Thomson' is difficult to confirm. A line appears to separate Martha and Joseph. Or is Martha deleted? These two have been heavily deleted so the first name cannot be read. It appears to start with E.
The last name is added to the left and boxed into the family. Why has Willm Hammil Junr been entered above Willm Hammil. For there is little mistaking the names. Clark (or Clerk) has been squeezed between the others. The above two have been added just above the next townland, with a line to separate them from the Gorticlogan families. However there is space in Ballynameen where another family could fit. The implication is not clear. Above family is crossed out. There are no other McKendry families listed. The old script deceives the eye and Turner appears very similar to Fisher, but it is Turner. 'Removed to Cleyvalley' is scribed across this family and Benjamin Saters. The ink is very faded hereabouts. The last 4 families have all been barely legible. The ink is still faded. Is that really Mildred? It could just as easily be Hildrod. The ink is still faded. The names are difficult to discern. The family is circled as if to encompass them in the next townland. The ink is still faint. Unusually, this family appears to be split over two pages. The ink is still faded: it is gradually getting fainter as we move towards the document's end and only a few later additions stand out. See family 278 in 1825 (July) list. McAnnary changes to McNerry. Above family is crossed out. However, see 1825 (July) F279. Last name added to right, in margin. This name was originally entered as Granger. But the G in each case has been distinctly crossed out and above the Cathren Granger is inserted 'Ranger'. Family heavily crosshatched out. They already are entered as #278. The family name has been entered only once and is barely readable. The rest of the family have a line by way of a ditto mark. This is probably Driss - spelt Drifs with an old English f style s. The initial D is however indistinct. There are also Driss families. Family is encircled as if to include them with the next townland. McCloskey or McHendry or something else: it's faded and illegible. Samuel (if such it be) is written over the line and number 288 so is difficult to see. Joseph is written Jeseph but seems otherwise clear. There is an X through the 'us' of Agnus. Individuals are usually deleted by a line through their name. Martha - probably, all that is readable looks like Marth without the a.
David? It is faded and blotted. What can be seen appears to be Dar.... dit it could just be a v and the length is right for David. Has been crossed out with an X. The manuscript is so weak and faded it's more and more difficult to read, but this has to be Ballintemple. The text is so faint that the first Alex.r is difficult to make out. There is an X through the 'e' of Samuel and through the 'm' of James. There is a squiggle after James Willson that is clearly a word, but written small. Hendry? If that, no clues as to what is its relevance. (______) First letter - W, M? the last letter is clearly h.
The script here is so weak it has all but vanished. Above family is crossed out with a large X. This family has been added in later and is clearly legible! Caraghglass is written with the old English f - i.e. Caraghglafs. The last name has to be Letitia, but it does appear to be written as above! 'Removed to Carraghglafs' is written across the family. A line apears to separate the Keers from the McKyes. The text is still extremely faded. The names cannot be discerned the writing is extremely faded. The names of the last three families (Josh Boyd et seq.) have been added later down the edge of the page. C 85 19 The name on the original is very hard to read. The number 341 has been used for twice here. C 84 19 now a small village. The hand here appears shaky but the ink is dense. One could suspect an already weak image has ben re-enforced at a later date. The two persons above have an X through their names. A gap is present as if to separate these two families. The place name is unreadable but is probably Garvagh. The name is barely readable, but McFall is the best guess we can make. Constantia: a name otherwise unknown. The text is very faded, but the family of an Andrew Dunlop appears in the August 1818 visitation with a 'Constantia'. His daughter, presumably named for this lady. Above family is crossed out. Errawin is nowadays Erwin or Irwin. The faint name looks like Tom and the surname Tom (or Tomm) is known in Derry. The ink from here to the end is slightly less faded and the names are more discernible. Gaun. Gawn is the old Scots form of Gavin. There is also no doubt about Rhoda, which is even more unusual. Simian. Otherwise unknown in the list, but such it appears to be. Woodburn has been deleted and Hutchison added. A rare name but it seems to be so. Undeniably Carrithers. We seem to be in an area of English families. Slowan is the old form of Sloan. Mullan C 91 13 is near Culnamen - this round is through townlands whose names are too faded to read.